Wondered where I was the last week? I've been making these. I've been teaching the 9-year-olds in Primary at church since January. Yesterday was my last day teaching them, since we're moving on Friday and Saturday. I'm going to miss them. They've been a great class. When I first started teaching them, I was trying to think of a good incentive to get them to bring their scriptures to class. We weren't really supposed to bring treat and I wanted it to be something that would be a motivator for them and also somewhat church related...and of course it had to be cheap since we've been living on a very limited budget. I settled on scripture bags. Many of them already had a scripture bag, but every kid I know loves things that are personalized for them. I'd made this one for Firecracker (which I never got around to showing you), so I took this in to show them. I told them if they brought their scriptures 12 times, I'd make them one. Well, most of them did it and I decided since I'm leaving mid-year that I didn't want to leave anyone out, so I made them for all of them. I have two left to go. I ended up using this pattern from Tricia at A Little Mundane. I did do a few things differently though. I used an old towel to cut up interfacing pieces for the cover instead of fusible fleece. This was a little more work, but was free...and saved me a trip to the fabric store 30 minutes away. I didn't do any interfacing on the inside layer. I used straps I'd salvaged from backpacks or other items we were getting rid of for the handles. I did some pieces and extra personalizing. I wanted to make each one personalized for the kids in my class because after all, that's how Heavenly Father's love is for each of us. He loves all of us, but for our own individual qualities. I didn't have time to take pictures along the way for a full tutorial, but I'll give you a quick run-down for each one. This girl wanted blue and lime green. (The colors are a little off in the pic.) The only thing I had in lime green was an old stained T-shirt, but I think the batik dressed it up a bit. I used a quilt-as-you-go technique to piece these, where I sewed the pieces to the towel interfacing as I sewed them together. It's a super easy way to get a random pieced look. This is the only one where the lining fabric is the same as the cover, but since it's a batik it still looked a little different. 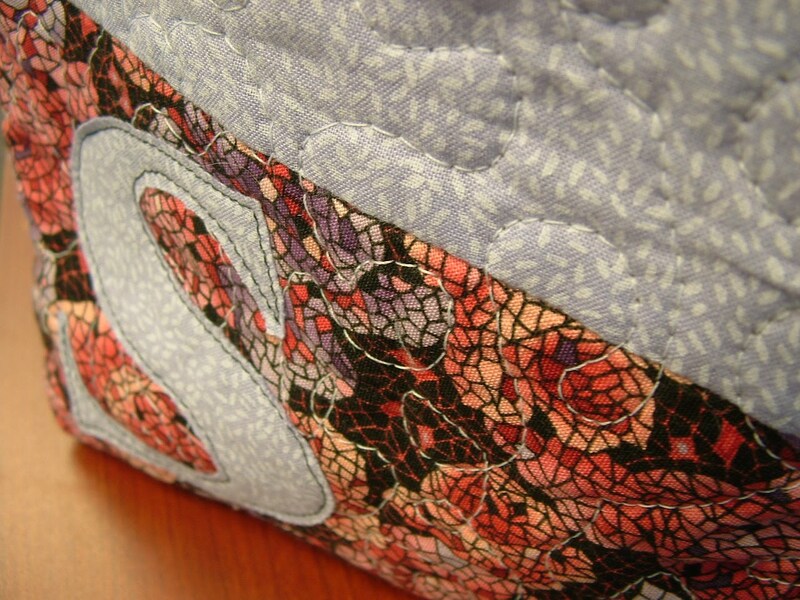 All the others have some kind of contrasting fabric inside. This boy asked for four different colors. I used the same quilt-as-you-go technique to piece his stripes. It was actually a little tricky to get the stripes straight this way, so if I had it to do over again, I would have made the stripes a little wonky, so I wouldn't have to worry about all of them looking straight. 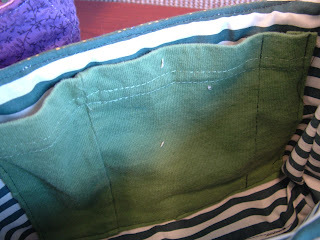 All the fabrics here are cotton, but I used knit for the applique to I wouldn't have to worry about unraveling. 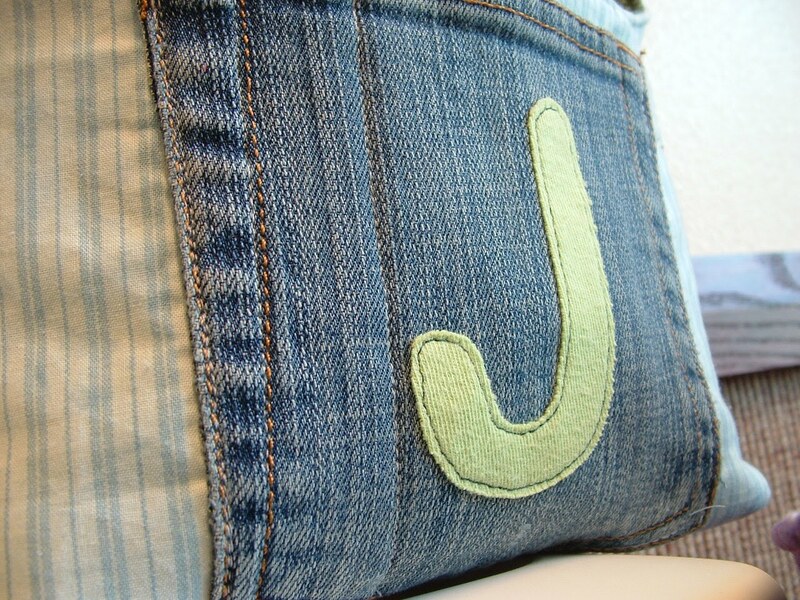 This boy asked for baby blue and green with pants pockets on his, so he got his pockets on the outside, including an extra seam there to make for a pencil holder. This girl asked for purple with flowers. Hers isn't pieced, so I used diagonal lines for the quilting. Then I put her initial on one side and a big fabric flower on the other side to dress it up a bit. The petals are woven cotton half circles gathered along the straight edge. 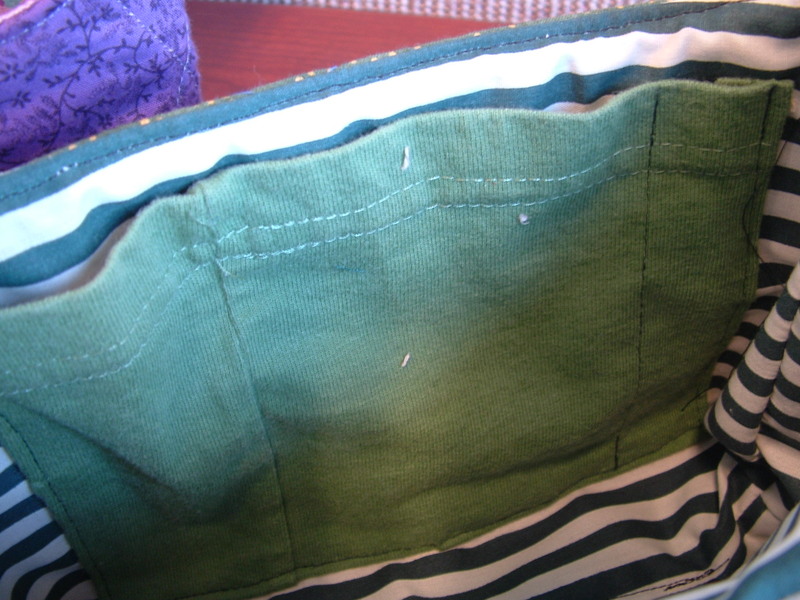 The center is a series of different colored knit circles that puckered up nicely when I sewed them on. This last one is mostly the same as the previous one...free motion foot for quilting. It only has one color for the cover, but I tried to spice it up a bit by using the knit with asymmetrical stripes for the monogram. For some of them I used a regular pocket that matched or contrasted with their lining. 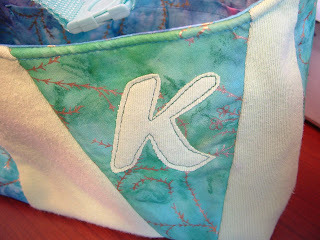 For some I used rrecycled t-shirt so I could use that hem instead of finishing that edge on my own. 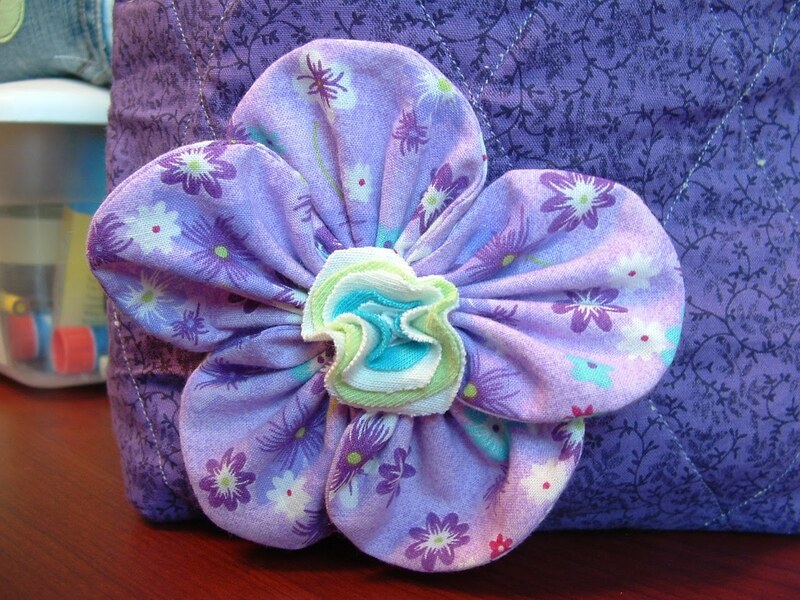 I still have two left to make in the next day or so before I can pack up my sewing stuff. The last two will end up on the simpler end, but I just don't want to leave any of the kids out. I love how each bag ended up matching the kids' different personalities...to me at least. A couple of the kids had the same initial and in both cases, only one of those students were there yesterday. I told them which was theirs but that they could choose the other if they liked it better...but they both chose the one that was intended for them. Hubby was AWESOME about keeping the kiddos occupied, so I could work on these and he didn't complain about our living room looking like a bomb had detonated in a fabric store. So cute! 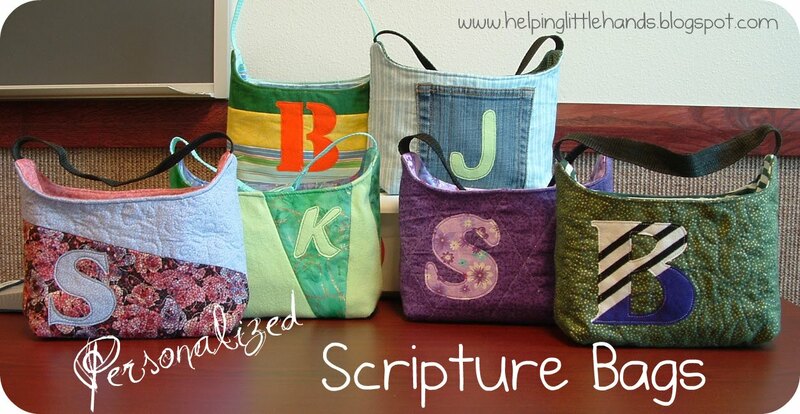 I would love to make one of these for myself to carry my bible in. Thanks for sharing! Stopping by from Making the World Cuter. Beautiful bags. I had no idea you were making them so beautiful and complex. 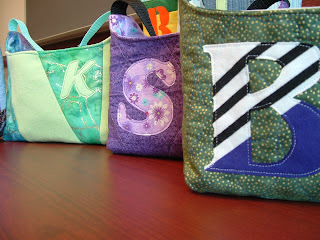 Wonderful ideas about how to make some very special bags to encourage the children to bring and love their scriptures. Look how talented you are! What a sweet teacher you are. I'm sure they're gonig to miss you. I'm hosting We're Organized Wednesday this week and would love for you to join the party. There's a great giveaway too. Hope to see you there. Another Linking Opportunity For Ya: Come Link Up! 200th Follower Link Party - You’re Invited! Great use of old clothes. These are absolutely adorable. Wow, these are so cute! 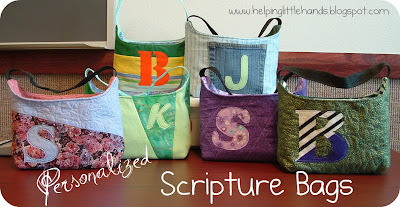 I have never heard of scripture bags before! But I love them!!!! Hope you got my email - with the html-code!? Those look awesome! I love it! I love you personalized them. How fun! 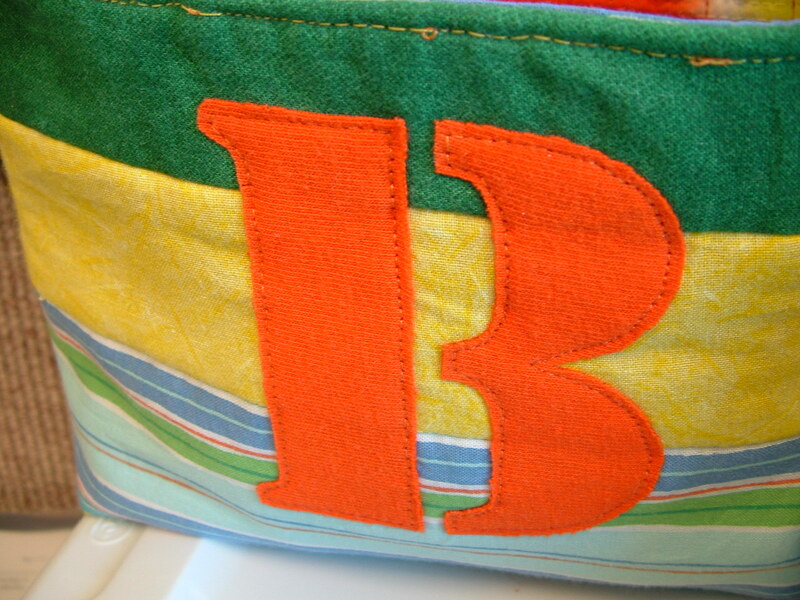 In June I made 24 + 8 bags to my daughter's aniversary so, I know how tuff it is! Those bags are awesome, you are very talented, hope your selling them. I'm new to this blogging thing and looking for some followers, any tips would be great. My blog is Save some money keep your honey, thanks.